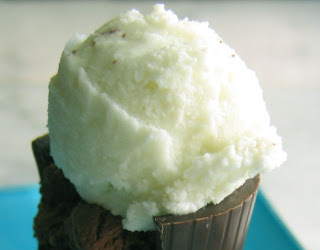 This particular mint gelato is more like a sorbet- wanting this to be less creamy than I typically make, I incorporated more skim milk and less cream (no eggs in a traditional gelato either!) Specifically created to go with the chocolate ganache dessert cups, I think you'll find this delightfully light and refreshing on the palate. muddle in the pan (use a wooden spoon and press or chop down on the leaves to help release the flavors). Cool and steep overnight, then strain out the leaves (be sure to push all the tasty milk out of the leaves), pour into your ice cream maker and process as normal. You may find this will not get as thick and creamy, but remember, I made this to be more icy. Perfect by itself on a hot sunny day!